Travel brand Craghoppers have introduced walking trousers for children that not only protect them from insects but grow with them. The new kids’ NosiLife Trousers offer up to 90 per cent protection from mosquitoes and other nasties and have a hidden extension seam to give them longevity as children grow. Craghoppers said: “In addition to offering protection from insects including mosquitoes, midges and ticks, and essential sun protection, the boy’s and girl’s NosiLife Cargo Trousers feature an additional innovation for the new season. The lightweight garments feature SolarShield UPF 40+ sun protection and moisture control to keep cool in hot climates; making them perfect for everyday wear, the company said. The boy’s NosiLife Cargo Trousers, selling at £30, are rugged outdoor trousers which have cargo styling with a leg pocket, an elasticated waist at the sides for additional comfort, plus a roll-up leg feature to turn them into crops. They are available in sizes 5-6yrs, 7-8yrs, 9-10yrs, 11-12yrs and 13yrs in Black Pepper and Pebble. 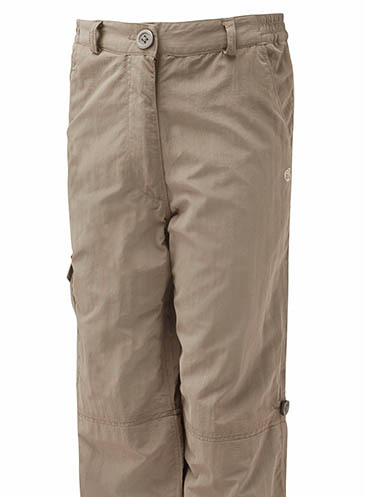 The girls’ NosiLife Trousers, at the same price, feature the same fabric technology as the boys’ cargos. They have a patch leg pocket, elasticated waist, plus roll-up leg and come in5-6yrs, 7-8yrs, 9-10yrs, 11-12yrs & 13yrs in Platinum and Mid Khaki. More details are on the Craghoppers website.